We like to show off this really unique piece of cedar - alas, this was a very rare find. We do not usually have cedar this wide. Our Texas Mountain Cedar is cut within +/- 60 miles of Johnson City, TX. None of it is cut east of IH35. It is also sometimes called Mountain Juniper or Juniper Ash. We have fence posts for sale in Texas! We are wonderfully busy out in the field right now. If you call us, please leave a message and an evening phone number where you can be reached. -- Thank you! Artists, Builders, homeowners, Interior Decorators - call us for your special needs. 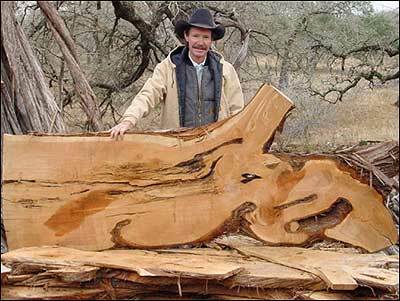 We have an incredible supply of unique woods of all shapes and sizes. We no longer peel posts, however we have wonderful posts for porches that can be stripped by the customer or their contractor with a power washer. Call for more information. Smaller cedar posts for building "Coyote" or Privacy fences. 5' - 8' lengths available (6' - 8' available in limited quantities). Cedar posts for many uses and of course cedar posts for building fences! Specializing in Texas Mountain Cedar also known as Mountain Juniper or Juniper Ash. Quality Mountain Cedar Fence Posts for a Fair Price! Early morning and mid-afternoon are the best times to try to schedule pick-up! Please schedule appointments at least one day in advance. Check our Facebook up-to-date News! We are WEATHER dependent - too much rain & we can't get in the cedar yard. even if the sun is shining the yard may STILL be too wet to get you in and out! 8:00 a.m. to 5 p.m. Friday) or email with your needs. We are incredibly busy out in the field right now. where you can be reached. -- Thank you!